For all the noise being made this month about Georgia, about NATO, about Tibet, etc, possibly the most portentous is that it seems Russia hit its oil peak (strictly speaking, its second – the first happened in 1987), well in line with peakist predictions. Production increases via application of new technology, as seen in the late 90’s and early 2000’s have been mostly exhausted; there are no megaprojects to bridge the gap beyond 2010. (There has been some noise about new oil field discoveries off Brazil’s coast which could contain as many as 33bn barrels, which has our dear Economist rejoicing: “the discoveries do suggest that the gloomiest pundits are wrong to predict that the world will soon run out of oil”. Just two problems. The issue is not about the world running our of oil – it’s about economically damaging declines in production which will, and are, hitting crucial sectors like transport and agriculture. Secondly, and more to the point, even the high estimate of 33bn barrels is enough for less than half a year of today’s demand of 85bn barrels.) Massive expansion in Russia has been the main reason while oil is peaking now, rather than five years ago. 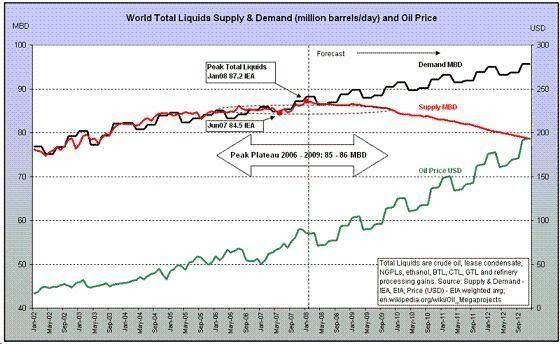 This, coupled with stagnant Saudi Arabia ‘refusing’ to increase oil production so as to leave more for future generations and oil prices rising to 120$, looks set to vindicate the Oil Drum predictions below. The third view is that the era of cheap resources is over for good — that we’re running out of oil, running out of land to expand food production and generally running out of planet to exploit. I find myself somewhere between the second and third views. No wonder survivalism is becoming respectable again. Not surprisingly, two key trends – rising energy prices and climate change – are colluding to produce a scramble for the Arctic and its lucrative hydrocarbons deposits. Russia has foresightedly been marking territory by staking claims in the UN, planting its flag at the North Pole sea floor and carrying out strategic bomber flights over the Arctic. Canada, Denmark and Norway have also been getting on in the action, while the US has been lethargic. Climate models indicate an ice-free summer by 2015, meaning northern Russia will become a major new transportation hub between Europe and East Asia (thus making the old dream of a North-East passage a reality). While wildlife wilts, agriculture booms – “Greenland is experiencing a farming boom, as once-barren soil now yields broccoli, hay, and potatoes”, and Russia keeps getting warmer. (What with rising world grain prices and the big lands left fallow following the Soviet collapse, it is easy for Russia to cement its status as a leading grain producer (from 81mn tonnes in 2007 to 110-120mn tonnes within a decade) by expanding the agricultural sector, a trend explained in The Medvedev Economy and confirmed by state investment into agriculture.) Not only will Russia remain a major hydrocarbons exporter, but will add cereals to its portfolio (which will, besides, increase in price), thus avoiding the fatal Soviet situation where profits from oil exports were eaten up by having to buy Western grains. The largest deposits are found in the Arctic off the coast of Russia. The Russian state-controlled oil company Gazprom has approximately 113 trillion cubic feet of gas already under development in the fields it owns in the Barents Sea. The Russian Ministry of Natural Resources calculates that the territory claimed by Moscow could contain as much as 586 billion barrels of oil — although these deposits are unproven. By comparison, all of Saudi Arabia’s current proven oil reserves — which admittedly exclude unexplored and speculative resources — amount to only 260 billion barrels. Currently, Russia has passed its second oil peak. Could the above make for a third peak? Discovery precedes recovery by around 30 years. 586bn barrels is about twice bigger than oil reserves in Russia proper before extraction ever began. Without ice, the extractive environment in the Arctic will be comparable to that of the North Sea. As such, it is plausible that Russia may even, around 2020-30, experience a third oil peak, at a time when global supply is severely constrained and prices are at 300-400 $ per barrel. What with its current (relatively low) consumption, this means that Russia may be spared from the energy crunch that will hit other energy-dependent economies in this time period. Perhaps most significant will be the geopolitical impacts (which, btw, we have covered in Towards a New Russian Century?). Russia is going to have to fundamentally rethink its traditional conceptions of itself as a land power, strategically weak and surrounded by predatory peoples who periodically exhaust the carrying capacity of their lands and launch invasions. It is going to become surrounded by ice-free water on two sides, along whose coasts will accumulate a rapidly expanding population (especially if environmental collapse causes mass immigration from South Asia, the Middle East and the Far East). This, along with a much greater stake in coastal transportation and off-shore hydrocarbons deposits, will require a much more powerful navy. No wonder Russia has tentative plans to create the world’s second largest surface navy within the next two decades, to which purpose a 410x100x14m drydock is currently under construction at Severodvinsk. The IMF has released its prognosis for the world economy. A slowdown is inevitable, driven by a US correction due to a housing crisis and its contagion of the world financial system. Global growth will decelerate in 2008, led by a sharp slowdown in the United States, amid a housing correction and a financial crisis that has quickly spread from the U.S. subprime sector to core parts of the financial system, the IMF says in its latest World Economic Outlook. Citing the unfolding financial market turmoil as the biggest downside risk to the global economy, the April 2008 report said the IMF expects world growth to slow to 3.7 percent in 2008—0.5 percentage point lower than what was forecast in the January 2008 World Economic Outlook Update. Further, world growth would achieve little pickup in 2009, and there is a 25 percent chance that the global economy will record 3 percent or less growth in 2008 and 2009, equivalent to a global recession. The main emerging market economies will diverge rather than decouple, with growth in China, India, Russia and CEE slowing but not catastrophically so, remaining close to their long-term trend rates. 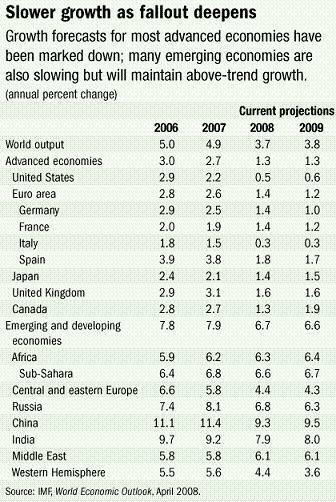 However, the government is even more optimistic, projecting 7.6% growth for 2008. Considering that Q1 GDP growth was 8.0%, driven as in the year before by consumption and investment, they have grounds for their optimism. On the other hand, CPI (inflation) is rising worrying fast, reaching an annualized rate of 13.3% this March, although it should be noted this is a worldwide phenomenom experienced by China (8.3%), India (8.6%), Czech Republic (7.1%) and Latvia (16.8%). The Ukraine (26%+) has been hit not only by high food and energy prices, but populist government largesse. (To take their minds off these matters, perhaps that’s why Hitler action dolls have gone on sale there, more proof if any is needed of the proclivities to fascism of certain sections of Ukrainian society. Gazprom will probably end 2008 as the company with the world’s second highest revenue (around 41.5bn $), similar to the budget of an economic basket case, say, Ukraine (43bn $). (Can’t help making these cheap shots, just ignore them if they irritate you). 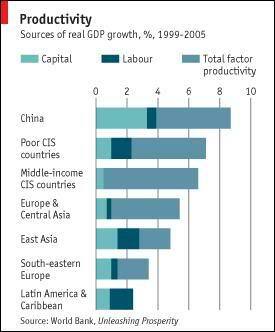 The Economist has an interesting graph breaking down GDP increase for major regions in the world by capital, labor and total factor productivity (GDP itself can be expressed as a Cobb-Douglas function of the above 3 components) from a WB report, Unleashing Prosperity. It is a splendid vindication of the ideas I expressed in Education as the Elixir of Growth. There, I made the argument that the education/’Human Capital Index’ (HCI) of each country is matched to a ‘potential GDP level’; where there is a large gap between potential and actual GDP, economic growth is highest. This above all explains the impressive economic growth we’re seeing in well-educated but relatively poor countries like Russia (once it abandoned its socialist shackles), and explains well the unimpressive growth of countries like Brazil, an badly-educated country with a correspondingly unimpressive economy. However, the linkages between HCI and productivity are even higher than between HCI and GDP (as GDP also depends on labor and capital inputs, which themselves depend on other demographic and social factors). From the chart, we can see that middle-income CIS countries (of whom Russia is, by far, the largest and most significant) had the largest increases in TFP, thus reflecting the huge gaps in its potential and actual productivity. While China’s absolute growth was much larger, almost half of it was down due to increases in labor and capital. However, considering China’s recent labor shortages and its unsustainably high investment rates, it is very unlikely that double-digit growth will continue in the near-to-medium future, particularly further taking into account that a) exports will be hit by US recession and b) from 2009 onwards the oil peak will start biting ever harder (as covered above). Latin American countries were the worst performers, seeing no improvement in TFP – in other words, they are about as productive as their levels of human capital allow them to be (withouta resource windfall or two).In a snapshot of other economic and related news, the housing bust has spread to the UK. Haiti’s government collapses after food riots – an ominous foreboding of things to come elsewhere? Between 2000 and 2007, median family incomes stagnated in the US, in stark contrast to the period between every other recession (the fact that the 2000’s saw a broad consumer boom becomes all the more worrying). The falling dollar has made US assets attractive, and Russia has accumulated around 10% of US steelmaking capacity – although it has not limited itself to the US, but also went on a shopping spree around Germany. Russia may allow the ruble to appreciate to rein in inflation. Moscow’s budget is now as big as New York’s. Confidence in the economy is increasing. According to the FT, Moscow could become Europe’s second financial center (after London) in ten to fifteen years. The Russian ‘brain drain’ has to a large extent ceased as funding and salaries increase in academia. Watch the cool video below, it’s now every day that you get to see a MiG-29 fire an R-60 missile at CBDR, within visual range and head on. Presumably Russia wishes to make a statement that it is ready and willing to defend Russian citizens (i.e. the vast majority of Abkhazians, and South Ossetians). It is also Russia’s traditional foreign policy level over Georgia – it’s separatist enclaves – being exploited. When Georgia pursued a relatively neutralist line towards Russia (under Shevardnadze), Russia kept at arms length from the separatists, but established a military presence in the region. Now that Georgia has received a promise of eventual membership from NATO, however, the levers have been pulled. If Georgia received MAP at the next summit, expect formal recognition of Abkhazia and South Ossetia. A German man is on trial in Germany for allegedly selling military technology to Russian intelligence. The Russian Army apparently has some serious problems with obesity. Greece agrees to host a section of Gazprom’s planned South Stream pipeline. Berlusconi held his first foreign meeting with Putin on 17th April, and Robert Amsterdam penned an acerbic yet poignant portrait of the less wholesome similarities between the two countries. The most recent data on Russian and American strategic nuclear armaments, as declared for the START Treaty, is available here. In contrast to the late Soviet period, it is now the US that has a preponderance of platforms. The breakdowns in deployed systems, Russian and US respectively, go as follows: ICBM’s (481 to 550); SLBM’s (288 to 432); heavy bombers (79 to 243); total (848 to 1225). The breakdown by numbers of deployed warheads is: ICBM’s (2027 to 1600), SLBM’s (1488 to 3216); heavy bombers (632 to 1098); total (4147 to 5914). The breakdown by throw-weight for ICBM’s and SLBM’s is 2370MT to 1830MT. In other words, while Russia has a slightly larger overall megatonnage, it has fewer strategic platforms and its missiles are less accurate. This is not yet a critical situation, what with the current international relations paradigm; nonetheless, further investments are necessary, particularly into the submarine and bomber part of the triad as well as ABM, in anticipation of the end of MAD due to the development of effective and comprehensive missile shields – which are closer to fruition, at least in the US, than most people realize. Perhaps I’ll write more on this in the future. An interesting article from the Times on WMD developments in Syria and North Korea. Foreign Affairs has The Age of Nonpolarity as its kindpin article for May/June. Summary: The United States’ unipolar moment is over. International relations in the twenty-first century will be defined by nonpolarity. Power will be diffuse rather than concentrated, and the influence of nation-states will decline as that of nonstate actors increases. But this is not all bad news for the United States; Washington can still manage the transition and make the world a safer place. Indeed, one of the cardinal features of the contemporary international system is that nation-states have lost their monopoly on power and in some domains their preeminence as well. States are being challenged from above, by regional and global organizations; from below, by militias; and from the side, by a variety of nongovernmental organizations (NGOs) and corporations. Power is now found in many hands and in many places…Today’s world is increasingly one of distributed, rather than concentrated, power. Getting everyone to agree on everything will be increasingly difficult; instead, the United States should consider signing accords with fewer parties and narrower goals. Trade is something of a model here, in that bilateral and regional accords are filling the vacuum created by a failure to conclude a global trade round. The same approach could work for climate change, where agreement on aspects of the problem (say, deforestation) or arrangements involving only some countries (the major carbon emitters, for example) may prove feasible, whereas an accord that involves every country and tries to resolve every issue may not. Multilateralism à la carte is likely to be the order of the day. I agree that the US is in relative decline and about the rise of multilateral pragmatism in diplomacy. Nonetheless, I question the thesis that state power is eroding. The state remains as strong as ever, and far stronger than their equivalents a hundred years ago. Several European nations take in more than 50% of their GDP in taxes. This rate in the distant past was only reached during times of total war, e.g. WW2. States are most certainly not “challenged” by either global organizations (which are simply assemblies of states where they can seek concensus), militias (which have always existed) or NGO’s (which operate under statal jurisdictions). Putin has become leader of United Russia, in addition to being the Prime Minister. Sean’s Russia Blog already has an excellent analysis in Gensek Putin (which also features a nice little demographics discussion in which my posts on the matter were mentioned). 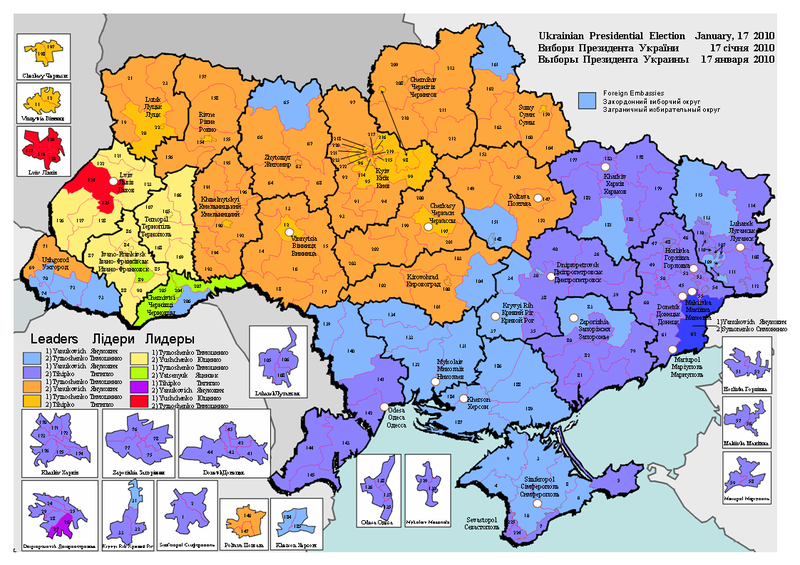 Since the Soviet breakup, Ukraine has been geo-politically spun in two ways. When Ukraine’s less Russia friendly side appears to have enhanced its stature, there is an increased yearning to drive Ukraine away from Russia as much as possible. When Ukraine’s more Russia friendly grouping seems strengthened, there is greater talk of mutual respect for the two Ukrainian ways of viewing Russia. Another Ukrainian perspective falls somewhere in between the two. On NATO expansion, “the will of the people”, takes a back seat for the Russia unfriendly crowd. The Orange Ukrainian government’s desire to have Ukraine in NATO has consistently run contrary to the majority of its citizenry. The explanations for this unpopularity include a not so well informed Ukrainian public, caught in a Cold War time warp. In comparison, there is little second guessing of polls showing that most Ukrainian citizens have a positive attitude on their country joining the European Union (EU). For some, Ukrainians are ignorant when stating apprehension about NATO and knowledgeable upon agreeing with the anti-Russian consensus; albeit for not always the same reason. Sean’s Russia Blog has comprehensive coverage of the Putin / Kabaeva rumors. Also a story about the hobbies of Russia’s nanotechnologists, e.g. building marchhead-sized chess sets. Demographic stats from Rosstat have come out for Jan/Feb 2008. While the birth rate increased by 11.3%, so did the death rate by 2.6%, reaching 15.8 / 1000 from 15.4 / 1000 in 2007. Seems that January was not an anomaly – the rapid improvements seen since 2005 have petered out, at least temporarily. But this is not totally unexpected, however. As I noted in my demographics posts, there is a very close correlation between mortality and the alcohol/food price ratio. Overall inflation in Jan-Feb was 3.5%, food price inflation was 3.6%; but the price of alcohol increased by 1.9%. The alcohol/food price ratio has fallen further, perhaps to its lowest ever historical level. In other demographic news, in 2006 there were 1.6mn abortions in Russia, hugely down from the 1990’s but still 2 to 3 times higher per capita than in the West. Finally a few public opinion polls. In February 2008, PEW released figures that showed 6 3% of Russians preferred a strong leader over democracy, down from 70% and 21% respectively in 2002, but a lot higher than in 1991, when a majority (51%) favored a democracy over a strong leader (39%). 74% would rather have a strong economy, while only 15% would like a good democracy. 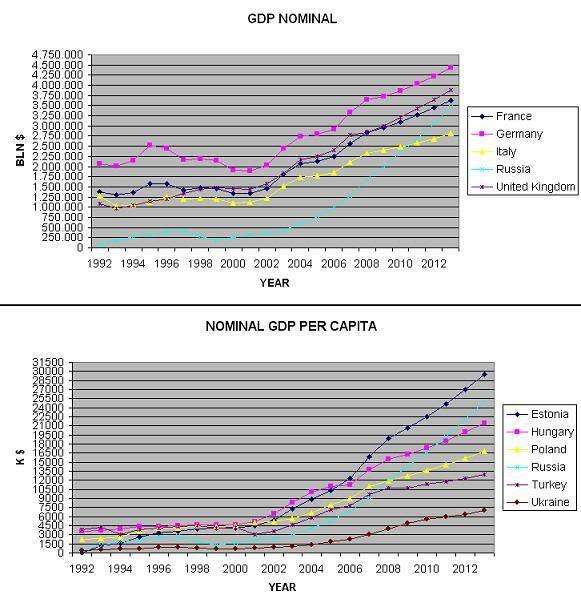 Ukraine, Bulgaria and even Poland show similar figures. In another rather interesting result, half of Russians agreed with the statement that ‘most people in society are trustworthy’, which is higher than the average for Eastern Europe and about average for Western Europe. 59% of Russians (almost certainly correctly) say there is no life on Mars, while 26% disagree. 49% of them believe that there’ll be a human on Mars and 59% think there’ll be a lunar base within the next 50 years. (Russia, like the US and China, has tentative plans for both enterprises). A new ‘Space Competitiveness Index‘ (whatever that means) has been compiled, in which Russia takes third place behind the US and Europe. China is fourth. 5 Comments to "News 2 May: Russia's Second Oil Peak"
Something tells me that the picture might not be so rosy for CEE (ex-Russia). The principal difference between Russia and CEE is Russia’s twin surplus (and correspinding twin deficit for probably all CEE countries, financed by foreign investment). In the present credit crunch their economies are set to suffer due to lack of investment. So while Russia might experience a gentle slowdown, the limitrophi might be in for a recession until their economies restructure. Current world oil use is roughly 30 billion barrels per year and 83 million barrels per day. Thus Saudi Arabia’s oil, at a claimed amount of 250 billion barrels, would last 8 years if the world had to depend on S.A alone for oil and production maintained at a level rate. The 90 billion barrels in the Arctic is enough for 3 years, and the Brazil oil 1 year. Current reliable sources say no real new oil discoveries have been made in Russia recently, but our information in the western world is incomplete. Given the vast expanses of Russia and the sea, there may be another 50 billion barrels, but much more than that is very unlikely. AK responds: Thanks for the comments, Jens (I have merged them into one). This is indeed the central problem of oil extraction – because of geological realities, you always have to keep accelerating to stay at the same spot. Much of the easy to get oil is being depleted and new sources are remoter, deeper and much more expensive (not only in monetary, but most importantly energy terms) to extract. The Arctic and Brazilian oil presupposes that the technology will be developed and implemented, and even then these new finds will come nowhere close to replacing the old super-giants in either quantity or quality. I completely agree with your implication that Russian oil production is going to go into terminal decline, probably from this year on, and that any future discoveries will be too small to make a difference (and assuming that their exploitation remains exergy-profitable, which is far from assured).